i agree! he'll even be worse with regret! it really looks like she's dead! but then when shin got hit he had so much blood but he was in a coma...could she be in a coma too? but it looks like they really killed her off! So we have to relook at all the ending scenarios . Human NS won’t be redeemed. He’s the ultimate villain , a product of old man’s greed and selfishness. I think he was kidnapped way before it happened. No matter how much he disliked mom at that point he would have never let her die! RELAX IT'S A DRAMA!IT'S A DRAMA!IT'S A DRAMA!IT'S A DRAMA! RELAX RELAX RELAX IT'S JUST A FREAKING DRAMA! I'm too sad !!!!!!!!!!! human shin should die too, why human are so bad?! im really angry to writers!!! The way they shot the scene she is dead, there were even articles about it and Ye Na asked her dad if he killed dr oh! Did Dr Oh die trying to save Shin III? Does Shin III really have less than hour to live? Did human Shin see his mom dying? quite bad ending in my opinion. He would redeem because he found the truth Seo killed both his parents? nope not buying it. Also I know its a robot vs human drama but did the writer really have to show it that way that robots are better than humans? Why just why did she have to make a pitiful character and make him evil? I mean we already had SEO! I kind of pitted him because he was stuck between chiarman and his son! WE DIDN'T NEED ANOTHER VILLIAN! Even if Shin comes back to the right track will he ever be able to live with whatever happened? Exactly . They didn’t have to push him to be so nasty right to the end. Do you think he’ll end up destroying himself ? It feels like it . @bebebisous33 @jerboa83 Any thoughts as to where we are headed ? Live caps complete in drama milk for everyone’s liking..
Omg my ship is dead! Dr Oh and David! Probably NS will go crazy and kill Seo. Or make himself killed. So sad that he wont get his happy ending. What if NS3 dies while trying to save NS? No, If I'm not wrong (I couldn't concentrate at preview coz my head was spinning lol) Seo has kidnapped him. You know the state where a person just gives up because they have lost everything? I guess he would live like that. NS3 – I want to cry like a human. NS3 – 11 hours…12 minutes… the kill switch is activated again. I'm also feeling like it'll just be a not so good ending !! I was also thinking there would be some good vibes between ns3 and hns/some sort of redemption for him at the end but it doesnt look like it anymore! ns3 looks like he might not survive and hns will blame him partly for not saving his mother! Soo atm it looks like none of our main characters will end well? so bong - loses her robot, hns - still pretty much the same flat 'evil' character with no redemption, ns3 - deactivated ? NS will regret not knowing his mom for the rest of his life! So is the writer going to make this the turning point of the story to redeem NS? NS will save NS3 from being imprisoned or destroyed so they can work together and put SJG in jail to avenge their mom?!! This scene Im sorry overshadowed the love scenes of NS3 and SB today. 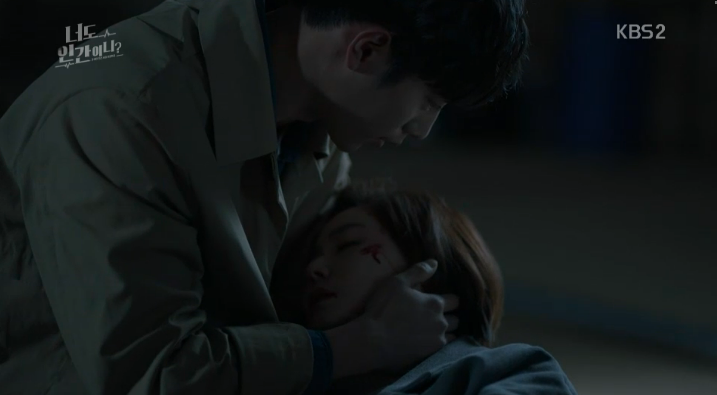 Such bad timing for so many hugs and a peck to this heartbreaking scene....writer nim what were you thinking??? I don't understand Dr Oh made the kill switch SURE she could have deactivated it as well no???? I feel bad for each and every character of this show except jongil and Grandpa!